What Is I Ching Hexagram 59 All About? Hexagram 59 gives wisdom on how to progress by tearing down anything that might be blocking your way. Through constant persistence and patience, progression is possible with little damage. It is critical to take the time to remove anything that might be blocking the way. When doing so, make sure to be persistent but also patient with the effort needed to remove obstacles. There will come a time when progress comes to a standstill. This is because there is something currently in place that is holding back the pace. 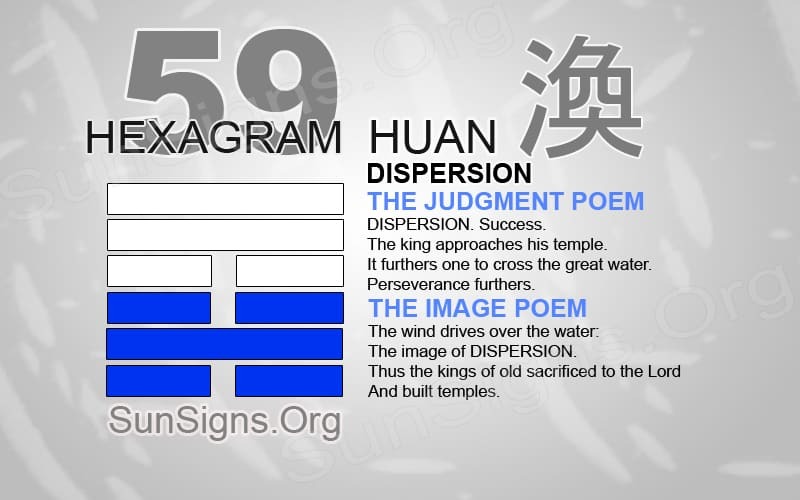 Hexagram 59 shows that by removing these barriers, progression is then possible again. Make sure the methods of communication are correct for the situation; that they are open and clear. The idea is to limit the amount of damage happening during this process. So, be prepared to take on extra work. A common example of a barrier would be either poor communication or a lack thereof. It is important to keep the gates of communication always open. Give all members of a team the opportunity to speak. No one enjoys going through a difficult period, especially one that deals with the slowing of progression. We are always progressing towards something. This progress can be towards a personal goal or a project at work or perhaps the deepening of a relationship. We could be trying to obtain great success. But to do so, you need a constant flow of progress. There will be obstacles in our way that will keep us from our achievements. Recognizing these errors quickly will allow for progress to begin again. I Ching 59 says that when in a relationship, communication is the only way you can progress. Make sure to speak often with your partner to learn all you can about their situation. But also be willing to listen to what they have to say. You might feel like the flame of love is dwindling or something is missing from the relationship. Then, take the time to discover what the error might be through open communication. When progress has stopped in the workplace, perhaps you should blame the lack of proper communication. Make sure every team member has the same information. Also, make sure they can operate on the same page so that will allow for a steady flow of progress. Sometimes, a member of the team does not understand what is going on in other departments. Then the unit starts to fall apart. Be willing to be a team leader and check in on all the associates. This way they understand what is going on in the work environment. Also, you can make sure that they understand their role and responsibilities within the group. Hexagram 59 says that persistence is the key to any phase in life. Always willing to continue moving forward and accept any change that might be occurring will result in success. Be aware of anything that might be holding you back. It can be as simple a lack of communication when people want to be heard. Make sure to remain calm when becoming aware of something blocking progression. There is no use becoming upset or angry with anyone or anything. We are unable to have full control over any situation. But we can be proactive in fixing the problem. Having an open mind and a clear conscious will aid in overcoming the problem. All phases in life are temporary, and this too shall come to pass.